Redearslider.com :: View topic - New tank ! Photo Gallery :: New tank ! Posted: Thu Oct 19, 2017 9:37 am Re: New tank ! Nice! What is the tank size? Posted: Thu Oct 19, 2017 10:02 am Re: New tank ! PokePony , don't see that little cartoon cloud in back middle by the one with her head up high ? You're going to be my new mommy ! Kind of looks like Shellby ? Posted: Sun Oct 22, 2017 3:20 am Re: New tank ! litefoot, how can you knooow ahahah ! Posted: Sun Oct 22, 2017 6:37 am Re: New tank ! Haha ! 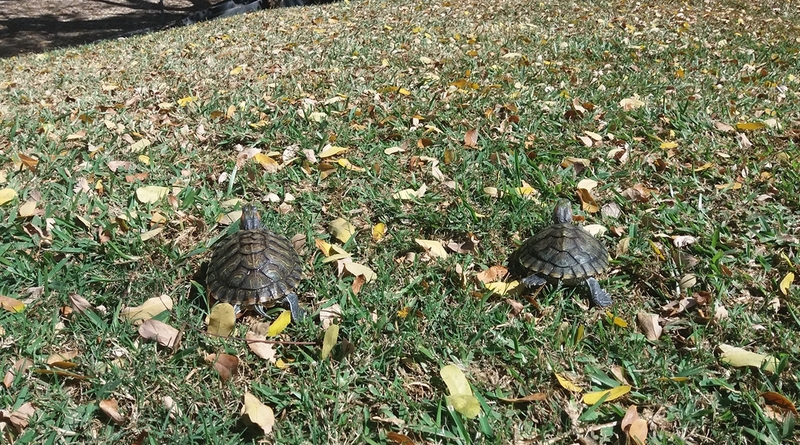 Over my years my turtles gave me turtle talking lessons!!! Seriously now , I learned to watch a turtles expressions ! As with humans that is a large part of communications. When one observes well you can tell when someone is lying from those macro expressions . There's a proven link between emotions and expressions and to me can be said true with turtles to. It helps when one can offer a lot of time to there pets I watch TV with Piggley , read to him ... also just fun one on one time playing. Yes turtles can play. Always watching his every expression ! Ever wonder why some pet owners have such a great connection with there pets especially dogs, it take patient's on our part. Posted: Fri Nov 10, 2017 5:27 am Re: New tank ! Took them out for a little walk. My grass is really dry yes. I just realised how much they've grown, they are like a year old and already look like adults. People love the green hatchlings but I still think they look beautiful and cute with the darker colours. Also I have a little question. I'm not super worried so I'm not gonna make a new thread. I know they are ready to shed now but it looks a bit weird idk. Is this normal for a shed or is this something else ? Posted: Fri Nov 10, 2017 6:34 am Re: New tank ! BG looks good to me ! As long as you and your turtles like it that's all that counts. Now that shed : This is my opinion. Keratin layer is sometimes thinner in places . The way turtles bump around may of hit it , rubbed it , crack it but looks minor . Like a sun burn on your skin sometimes it comes off in sheets and other times in a million pieces. I do see a very little fungus around it but to me should be ok , will come off in shed. Just observe very well that it does not get worst then needing treatment. Keep a clean tank , good basking temps and all should be good. It would not hurt to wash it ( OTC surgical scrub ) and make sure it stays clean so a bacteria and or a fungus does not take control. Do not try to help the keratin layer off could damage new under shell. Let nature do it's thing. Keep area clean and should be good. May take that area a little longer to shed than other areas but will shed. 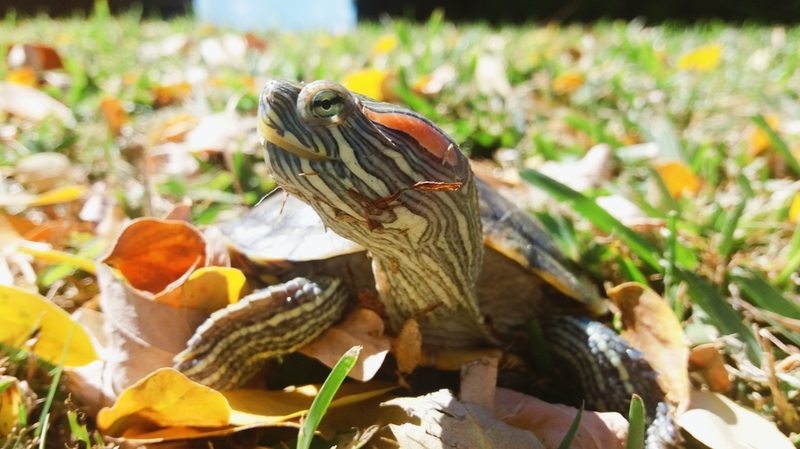 You have good looking turtles ! Posted: Fri Nov 10, 2017 6:59 am Re: New tank ! I take them out more often in summer because it's hard to keep the water cold, so they bask less. I think I'll do a little scrub and a bigger water change just in case this weekend ! I haven't seen anything on Shellby (it is Shelldon's shell on the picture) but I will scrub both of them because I am extra. Thank you for the kind words, they appreciate it ! Posted: Sun Mar 04, 2018 10:47 am Re: New tank ! 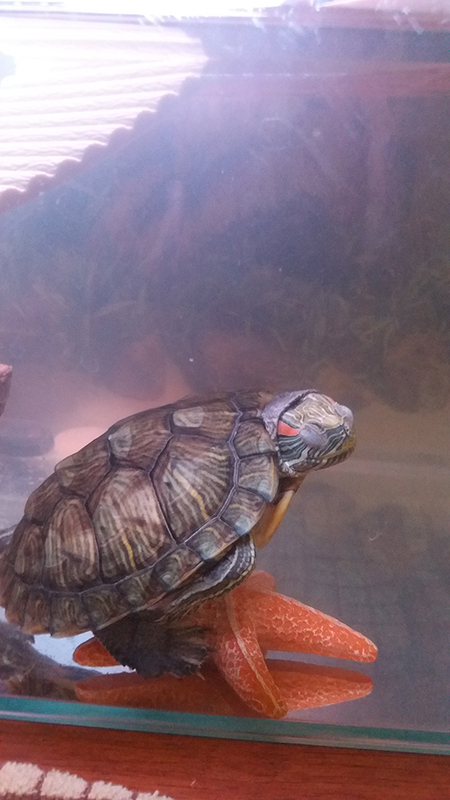 PokePony wrote: Is it okay if I post other pictures of my turtles ? Posted: Sun Mar 11, 2018 9:38 am Re: New tank ! Posted: Tue Mar 20, 2018 10:48 am Re: New tank ! Guys I think Shelldon might be a Shelly afterall But I might need to wait another year to be sure. Posted: Tue Mar 20, 2018 7:18 pm Re: New tank ! Do you have a pic of their cloaca? Underside of the tail when their shell is 4" or so is the most reliable way to tell m/f. Posted: Wed Mar 21, 2018 6:58 am Re: New tank ! EDIT: I've managed to see, I don't know why I haven't thought of this before. I put some treats floating in their tank and I went under to see. They are both female! First of all, that's some good news because that means there is a chance I won't have to separate them (no breeding!). So... Shelldon is officially Shelly now. Posted: Tue Mar 27, 2018 10:19 pm Re: New tank ! Posted: Wed May 02, 2018 7:57 am Re: New tank ! So I changed the tank a bit and added sand as well They LOVE it! Always playing and digging around. Posted: Thu May 03, 2018 7:29 pm Re: New tank ! Looks so nice, the water is looks so clear!